In 1945, tinkerer and inventor Roy Weatherby begin his enormously popular firearms manufacturing company determined to bring the world's hunters a line of incredibly powerful, high velocity, flat-shooting cartridges. In 1953, he introduced .378 Weatherby Magnum ammo (actual bullet diameter is .375 inch; 9.5mm). 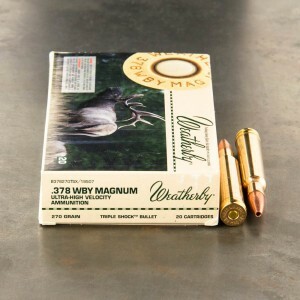 378 Weatherby Mag ammo cartridges typically feature bullets ranging from 200 grain to 300 grain, in both soft points and solid points. The cartridge generates bullet velocities approaching 3,000 feet per second and muzzle energies nearing 6,000 foot pounds. Performance like that make the round a lethal dose for all North American big game species. It has proven a superb elk and bear round for western hunters. Many use it as well even for the African big five! In fact, Roy himself shot an elephant with his new round. But it is not for the faint-hearted as it packs quite a wallop in the recoil department (77 ft-lbs. verses 20 ft-lbs. in a .30-06). However, for those who can wield the powerful round, it's a sure big-game stopper bar none!